Trap The Thief info about the game-Games2Rule. 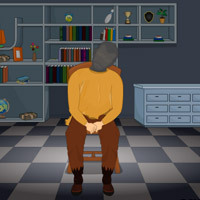 Trap the Thief is another new point and click room escape game from games2rule.com. So far in escape games you will be trapped inside in a room and you have to escape from there. But in this escape game you have to trap a thief in a room and the keep the door locked. Make sure that thief should not escape from there by finding useful object, and hints. Good Luck and Have Fun!